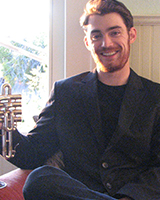 Trumpeter Ian Cochran comes to the Bay Area from Chicago where he worked as an active freelance performer and teacher after pursuing a Master’s degree in orchestral trumpet performance. In addition to his orchestral training, Ian has worked in several commercial music settings including improvisational jazz, country music, rock, funk, R & B, studio recordings and more. After completing an undergraduate degree from Baldwin-Wallace in Cleveland Ohio, Ian traveled with the Emmy Award-Winning PBS Television Production of Handel’s Messiah Rocks! He previously was appointed a position with Calvin Gilmore’s Carolina Opry in Myrtle Beach, SC. By studying and performing alongside many of today’s top orchestral brass musicians including many of his heroes from the Chicago Symphony Orchestra, Cleveland Orchestra, Berlin Philharmonic, Detroit Symphony, San Francisco Symphony and others, many of Ian’s musical dreams have been realized, something he hopes to humbly pass on to all of his future students.